Then, Julie, Rich’s wife, and her sons close the night with a musical offering. The guitar that was propped up on the wall is now in her son’s arms; a tambourine lays in another son’s hands. As the tears streamed down my face, it became clear. This is not just my race tomorrow. I’m racing for all of the people who have believed in me along the way; I’m racing to give hope to others that anything is possible despite what fears may fill me. This race is bigger than me. It’s more than I know… I’m more than I know. All of a sudden, I’m calm. The anxiety about the waves and the sharp bike turnaround leave me. I wake up the morning of the race, eat my oatmeal with a spoonful of hazelnut almond butter and play “Home” on repeat until I leave the hotel room. It will all be clear. I’m going to make this place my home. Before I know it the waves are crashing over me, leading me to shore. As I run up the sand, completely out of breath from the pounding I got coming in, I see a familiar face – our producer Matt - on the side cheering and reporting on the walkie-talkie: “Adrienne’s out." Cue the face plant into the sand. Note to self: don’t get distracted. With my heart rate still racing, I start the trek into transition, wanting to stay in the shower stream for at least a minute, but I continue on. At the bike rack, Chrissie Wellington is waiting for me. As I down two electrolyte gum drops and drink some more electrolytes, she is there talking me through it all. And off I go. I hear on the PA system, “And here comes another athlete from CNN Fit Nation.” I pump my fist in the air and reach the bike mount line. It’s less hectic than I thought. I have the time and space to mount the bike, get clipped in and get started at my pace. Visions of a crazed, crowded start were unfounded. At the pre-race mandatory talk, the race director mentioned there were four crashes from the international distance race the day before. He told us to take caution at the speed bumps – one of the crashes occurred there. At two of the five speed bumps going out of the Zuma Beach parking lot, racers came zooming up behind me trying to beat me to the one foot of flat ground that allows racers to sneak by the speed bump unscathed. One of them gets there before me, causing me to brake unexpectedly. The second time, I stand my ground and the speed racer comes screeching to a halt as I pass through. As I get to the turn to go out on the Pacific Coast Highway, Jeff Dauler comes up from behind me. Jeff’s a natural on the bike, and I know he’s going to totally kill this leg of the race. I tell him “Have a great ride” and off he goes. Slow and steady… and far on the right. This describes my biking experience. I did end up having to pass a few people, more than I imagined. And a ton definitely passed me. But I met my goals for the bike: to not get a flat, not get hurt and not drop my chain. At the first downhill, I hear from someone on the sidelines say, “You need to shift down three clicks." It catches me off guard at first…. shift down while going downhill?? But I obey and soon see why. The steep ascent that awaited me was claiming causalities. I see Glenn up in front of me who has fallen off his bike as he struggled to make it uphill. He’s putting his chain back on his bike, and as I pass by, I tell him, “You got this GK.” I find out later, this is one of four times his chain fell off. I give him so much credit for sticking it out. At every downhill, I brake cautiously while others race on by. Speed still scares me. My overall time could probably have been 5 to 10 minutes faster if I didn’t brake so darn much. But at least I feel like I was in control. Actor Jon Cryer suffered a nasty crash going downhill that took him out of the race. Supposedly he was trying to be aggressive on the downhill and lost control, skidding 15 feet on his skin while cracking his helmet. So glad I didn’t see that happen. The most anxiety for the entire tri was at the turnaround point on the bike course. We didn’t have the chance to ride the course before the race, but I was warned of a “hairpin turn” at the turnaround after the sharpest descent on the course. No worries – I came into that baby going about 5 mph, much to the chagrin of the pros who were trying to race by me in the 3 foot wide bumpy path. Once I turn south, I begin grinning from ear to ear. I take my time to admire the view. Even though I have a few steep hills ahead of me, in my mind I am home free. When I came into transition, I feel like a million bucks. I knew Nancy, Rick, and Jeff were ahead of me on the run, but I also knew that this was my strongest leg of the race. I’m picturing Chris waiting for me at the finish. In the last mile, I pass this van blaring Brittany Spear’s “Toxic” and I stop and bust a few moves. The finish line is just within reach. As I pass under it, my arms go up, fists pumped and the first person I see isn’t Chris but Chrissie, waiting to congratulate me. “You did it! You looked fear in the face and conquered it!” she says. Finally - there he is. I reach over the barrier and hug the man who has supported me the most during the months of training. Cause I’m gonna make this race your home. And now this race now feels like home too. 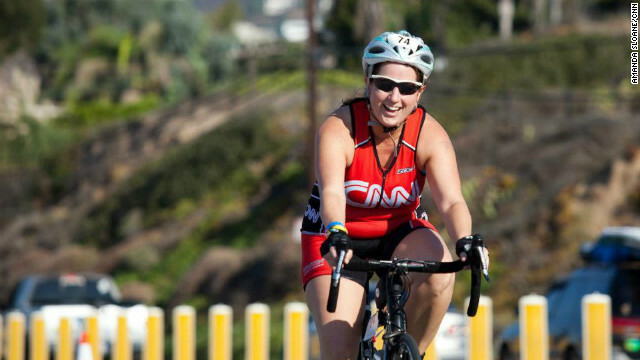 See you in 2013, Nautica Malibu Triathlon! Beautifully written! You are such an inspiration to so many. I am proud to call you my friend. Looking forward to seeing you accomplish the next goal(s) that you set for yourself.